Doncaster's most famous engine, made the Flying Scotsman one of the most renowned steam engines in the world. Built at Doncasters works in 1923, it went on to do the first London to Edinburgh run and be the first locomotive to travel at more than 100mph. The Mallard was built at the Doncaster plant and holds the world speed record for a steam engine of 126mph. 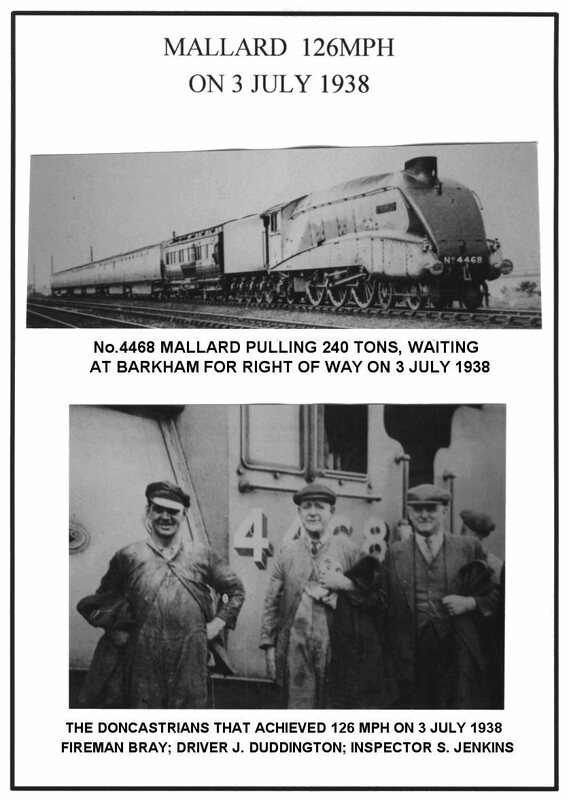 When the record was achieved the engine crew were two Doncaster men. Joe Duddington (driver) and Tommy Bray (fireman). Contributor Gary Goodlad writes: "Joe Duddington married my Aunty Florry. He was apparently a well known steam locomotive driver and I am surprised that no mention is made of him, or the others, at York Railway Museum where the Mallard is normally kept on display. Joe was said to be a fearless driver and although the Mallard was shaking badly and coal was flying off the tender during the record run, they continued onwards until they broke the speed record. Unfortunately, the Mallard suffered from an overheated bearing on its epic world breaking run and had to be towed into London, which was a bit of a disappointment for all concerned." Here's another photo montage of that Record run.